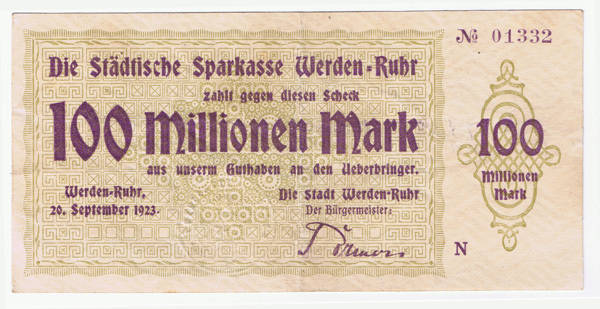 The Weimar Republic is perhaps the quintessential example of hyperinflation. But the buildup took longer than one might think. Walter Levy is a German-born oil consultant. His father, a German lawyer, took out a life insurance policy in 1903. Every month he had made the payments faithfully,” recounts Levy. “It was a twenty-year policy, and when it came due, he cashed it in and bought a single loaf of bread. Such was life in the German Weimar Republic. Things got so bad there for a while, dentists and doctors stopped asking for currency, seeking payment in butter or eggs instead. But the farmers weren’t keen on trading their produce for paper money either. Prices rose not just by the day, but by the hour — or even the minute. If you had your morning coffee in a café, and you preferred drinking two cups rather than one, it was cheaper to order both cups at the same time. At eleven o’clock in the morning a siren sounded and everybody gathered in the factory forecourt where a five-ton lorry [truck] was drawn up loaded brimful with paper money. The chief cashier and his assistants climbed up on top. They read out names and just threw out bundles of notes. As soon as you had caught one you made a dash for the nearest shop and bought just anything that was going. The flight from currency that had begun with the buying of diamonds, gold, country houses, and antiques now extended to minor and almost useless items — bric-a-brac, soap, hairpins. The law-abiding country crumbled into petty thievery. Copper pipes and brass armatures weren’t safe. Gasoline was siphoned from cars. People bought things they didn’t need and used them to barter — a pair of shoes for a shirt, some crockery for coffee. Berlin had a “witches’ Sabbath” atmosphere. Prostitutes of both sexes roamed the streets. Cocaine was the fashionable drug..
Weimar Germany is of intense interest today as fears of hyperinflation abound. Some folks, as we have seen, are expecting a literal repeat of Weimar (or Zimbabwe) practically any day now. But apart from the stories — which are frightening but fun — there is another interesting parallel to draw from the Weimar experience. But here is the thing. Inflation had been running rampant in Germany well before Weimar came about. Largely due to the war, prices had already doubled between 1914 and 1919. Not only did the ramp-up to hyperinflation take a while, but the German government remained complacent long after inflation strains went from moderate to severe. More than inflation, the Germans feared unemployment. In 1919 the Communists had tried to take over, and severe unemployment might give the Communists another chance. The great German industrial combines — Krupp, Thysen, Farben, Stinnes — condoned the inflation and survived it well. A cheaper mark, they reasoned, would make German goods cheap and easy to export, and they needed the export earnings to buy raw materials abroad. Inflation kept everyone working. So, if the United States is to echo Weimar Germany, one might argue we need to see years’ worth of rampant inflation first… with a government intent on doing nothing about it. And that would constitute a very valid point — except our biggest bubbles have already gone bust. We had a massive housing bubble and it popped. We had a massive bubble in the price of oil and that popped too. Furthermore, the consumer psychology of ever-rising price expectations was shattered by these busts. When U.S. consumers look to real estate trends and personal income trends, they do not see prices going up. They see them going down. Again, the goal here is not to rule out the prospect of hyperinflation completely. Instead, the point is looking to history in search of some perspective. We have already addressed the first part. The 2000s did indeed see a multiyear period of sustained asset inflation and commodity inflation, but a huge bust came on the heels of that. When it comes to inflation as a Washington hot-button issue, the political mood right now is anything but relaxed. One might call it vigilant, or even hyper-vigilant (no pun intended). That is why an aggressive political shift is forecast for the upcoming U.S. elections. Austerity has caught on with the public, at least in theory. We are also seeing a certain comfort level with unemployment in the United States. The private sector is perfectly happy to fire workers left and right in its effort to cut costs and improve profit margins. Washington may not be happy about this, but there is no political will to radically change the situation (and no simple means of recreating jobs). The good news is, factors like these mean we have time to think, to respond, and to plan. If things were about to go to hell in a handbasket right away, that would represent less opportunity to profit… and less time to flexibly prepare for the great unknowns ahead. After World War I, every nation which fought was broke because of the war’s cost. No country had enough gold assets to repay the billions of dollars they owed. And this was a multilateral problem. For example, Britain could not repay its debts to the US until the other Allies repaid their debts to Britain. The Americans were not sympathetic. The prevailing desire was recovering the over $25.5 billion the US had loaned to other nations during the war. As a result of these debts, the war’s victors laid out draconian terms to punish the Germans in the Treaty of Versailles in 1919. War reparations were one third of Germany’s spending. Therefore, Germany’s budget deficit was half of GDP. (The situation in Iceland due to Icesave’s collapse comes to mind here). And to make things even worse, reparations were in a foreign currency. It’s not as if the Germans could print off a bunch of Reichsmarks to make good on their reparations (The Reichsmark is the more legitimate currency that came into being after the hyperinflation). When the Germans defaulted on their obligations, the Belgians and the French moved in and occupied the Ruhr region, Germany’s industrial heartland. The result was widespread strikes and idled productive capacity. Afterwards, demand for goods in Germany far outstripped the productive supply. So, with a huge portion of tax revenue going to pay reparations in foreign currency, the German government turned to the printing presses to make good on its domestic obligations. The surge in money supply and the lack of productive resources led to hyperinflation and collapse. The key to Weimar’s hyperinflation was two-fold. 1) The German government had a large foreign currency debt obligation. 2) The German economy lost huge amounts of productive capacity causing prices to soar as demand outstripped supply.